Above: Gov. Hogan says he’ll “get this cleaned up” in interview with CNN’s Don Lemon. In an interview with CNN’s Don Lemon late Monday night, Gov. 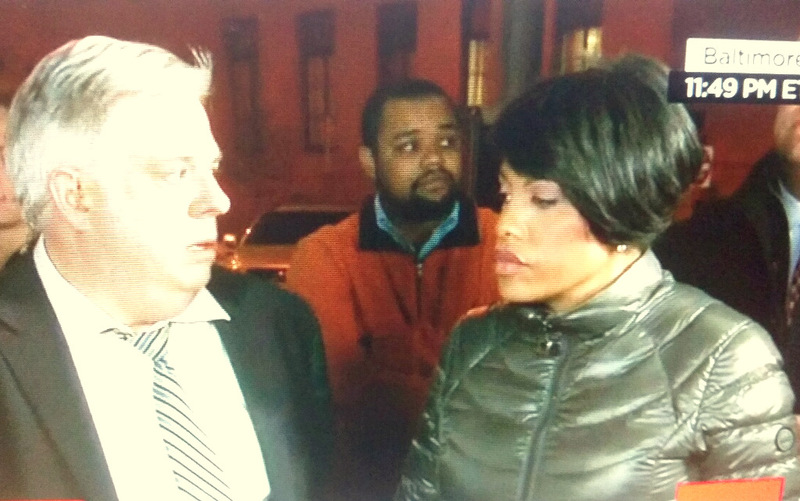 Larry Hogan said he’s “taking over the situation” in riot-torn Baltimore as Mayor Stephanie Rawlings-Blake stood quietly by his side. “I’m moving the governor’s office to Baltimore City first thing in the morning,” he brusquely told Lemon in front of City Hall. He said he had just toured the city’s Emergency Operations Center on Calvert Street. “We’re bringing our entire cabinet. We’re bringing all the assets we can. We will get this under control. The city will be safe, and Marylanders will be proud of the effort once we get this cleaned up,” Hogan declared. The interview ended abruptly when Lemon pressed the governor about why the state did not intervene when violence broke out in Baltimore on Saturday night. After saying he did not want to dwell on the past, Hogan said he was ready to provide aid on Saturday, but the mayor did not request help until today. When asked again, Hogan gestured to have his microphone removed, and Mayor Rawlings-Blake informed the CNN anchor that the interview was over.